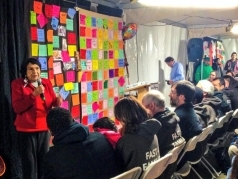 On December 3, Dolores fasted in solidarity and joined “Fast for Families: A Call for Immigration Reform and Citizenship,” taking place on the National Mall, steps away from the Capitol. Leaders and immigrant members of the community have been fasting fast every day and night, abstaining from all food—except water—to move the hearts and compassion of members of Congress to pass immigration reform with a path to citizenship. The fast in Washington, DC is being held in conjunction with dozens of local and solidarity fasts, events, and actions already underway in key congressional districts across the country. Fasters will be joined nationwide by groups and activists who are prepared to make sacrifices for the passage of immigration reform with a path to citizenship.